ELLENVILLE, NY (June 1, 2015) – At the Shadowland Theatre in Ellenville one becomes aware of an Olympian force that guides the pens of playwrights yearning to expose the American culture in a manner that is truthfully obtuse and frequently offensive. Arthur Miller, Edward Albee, and for this discussion Bruce Norris are guided individuals who have exposed the effects of culture on human behavior. 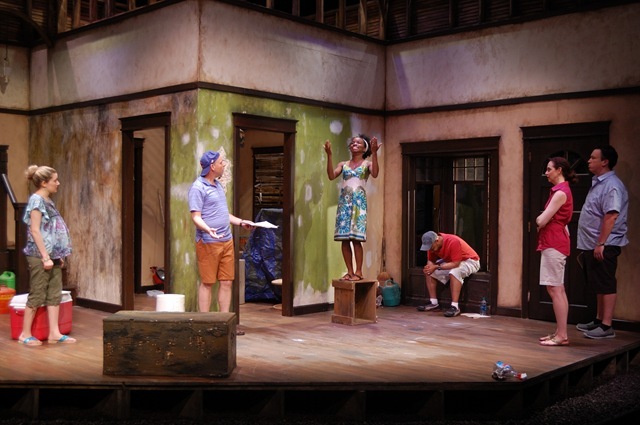 And to accommodate the flaws of those characters who thrive, survive and die in Chicago’s Clybourne Park, the city’s shoulders must be broad and husky! 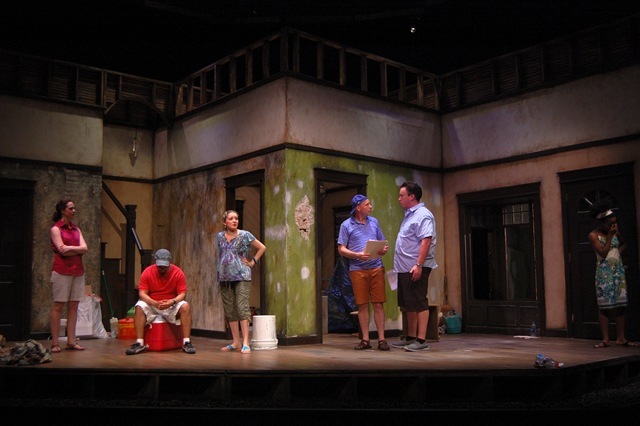 As alluded, the movement of this play is charted by the American culture, which in the eyes of Bruce Norris, is bigoted, prejudiced, and opinionated. Collectively these elements provide the necessities for a bubbling caldron of “toil and trouble.” This is theatre at its peak, theatre that causes one to think, ponder and examine the culture that governs human behavior. To begin the journey, theatre goers enter the house to an open stage, as Act I reveals an undisguised display of a fifties-era living room, complete with a finger-dial phone and a transistor radio. It’s not bright, yet not dull. It appears quite accommodating, as Christopher and Justin Swader have designed an honest set, one that causes reflection: “Been here before?” one might ask. A ditto can be recorded for the Act II set. It is honest and conveys an all-important unity of purpose. All of this is fine, as Technical Director Eli Reid applies his trade along with Lighting Director Richard Currie who has mastered the appreciative value of “fade outs.” But what causes this series of dramatic conflicts to ferment and boil is an assemblage of highly competent actors, who under the firm and proficient direction of James Glossman, nurture and usher the audience down a path of discovery and hopeful introspection. The cast is brilliant in its own way as each member may proudly wear a well-earned crown of laurels. There are seven characters in this play, as actors from Act I assume a new and different character in Act II. Impressive in Act I, is Wayne Pyle as he delivers a seriously depressed Russ to the audience. Russ and wife Bev, vividly depicted by Katie Hartke, have just sold the property in question to a black couple. His cantankerous, belligerent rage simmers just below the surface and finally erupts as he interacts with his fellow Rotarian, Karl, portrayed enthusiastically and credibly by Michael Pollard, who is hell-bent to halt the sale of the house to a black couple. 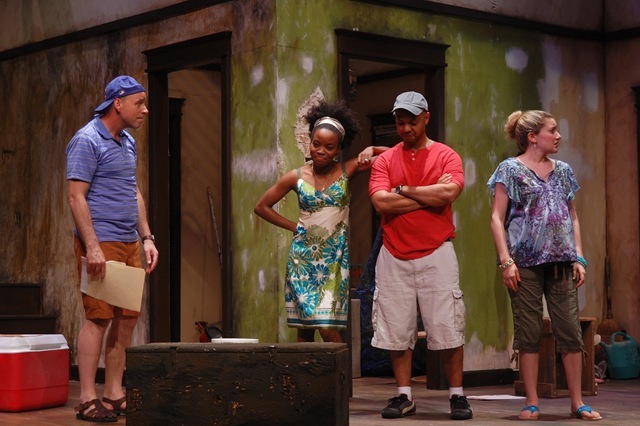 Karl and others, including the family’s pastor, a clumsy, babbling individual effectively delivered by Dan Mian, fear the demise of the neighborhood and the loss of monetary value that will be the result of blacks living in Clybourne Park. In Act II, this promising and plausible Michael Pollard portrays Steve, the young man in his late thirties who wants to renovate the old house which is now in an all-black neighborhood. 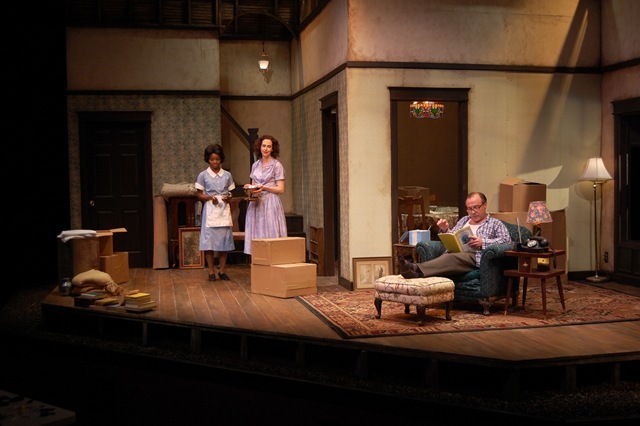 It would be dishonest to review this production of Clybourne Park without directing a follow spot to Emily Sucher, as she so accurately and convincingly depicts an appropriately attractive white girl, married, pregnant and profoundly deaf. She has the pronunciation deficiencies characteristic of one who is unable to hear and imitate individual sounds or phonemes while displaying the ability to sign accurately. 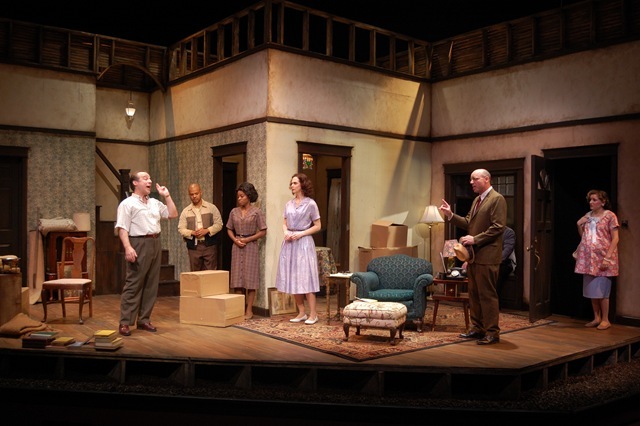 Clybourne Park is considerably entertaining and profound, as its two acts travel their intended paths quickly and with a designed cohesiveness. Each act displaying a reflective culture that promotes racial divides and the oblique nature of human behavior. The racial jokes are hacky, with the intended purpose of promoting introspection and exposing the awkward negativity of blunt racial humor.